Well, that was close! I almost missed my 35,000th tweet! Time flies when you are having fun, right? How would you like to win a $25 Boston Pizza gift card? To commemorate this occasion, I've partnered up with Boston Pizza to do a giveaway! I've visited Boston Pizza many times, and have always had a great time. The food is amazing, the service has always been impeccable and the atmosphere is always fun! Boston Pizza is a great place to go for dinner with the family, as they have a full kids menu available. But fear not you childless readers! Boston Pizza is an awesome place to catch a game and/or have a few drinks. 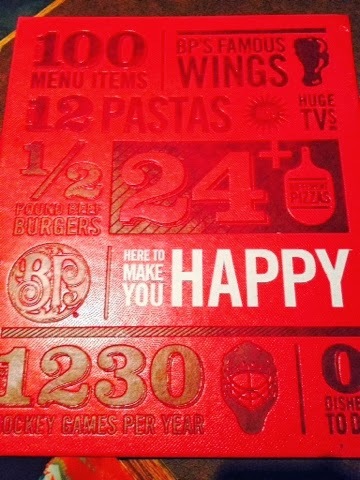 I had the pleasure of visiting Boston Pizza the other day and noticed that their menu has been revamped. I ordered one my favourite dishes, the BBQ chicken pizza. Chicken? Good! Multiple cheeses? Good! Mushrooms? Good! Sweet, tangy BBQ sauce? Good! All of the noms! 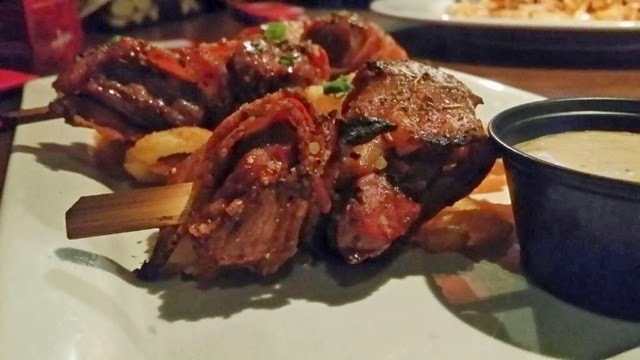 Another dish we ordered was the Bacon-Wrapped Steak Skewers. They're basically mini 2 bite filet mignon.s They're seasoned and cooked perfectly, served on a bed of mini fried onions with Boston Pizza's creamy steak sauce. 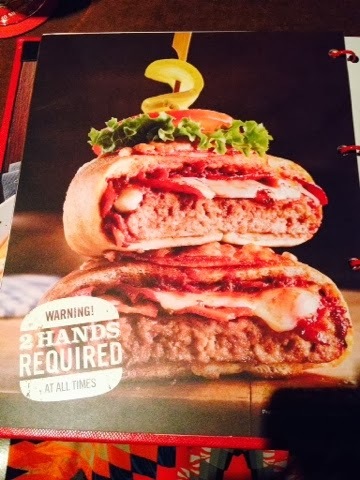 And, I mean, umm, hello - have you seen the pizza burger?! *get in my belly* I haven't had the chance to try this one for myself yet, but it looks AMAZING! A few friends have had it and they say while it is incredibly delicious, it is also quite filling. For dessert, we had the Panookie. This was DELICIOUS! It's a giant, freshly baked, pizza-pan chocolate chip cookie served with vanilla bean ice cream and drizzled with chocolate and caramel sauces. The cookie is so warm and soft! I said I was only going to have a bite or two....but of course, I ended up eating most of it! It was too good to refuse! Valentines Day is coming up and Boston Pizza is bring back the #heartshapedpizza. 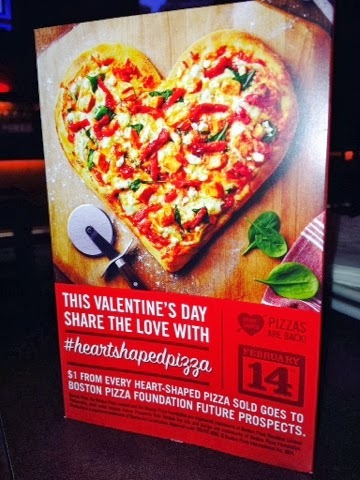 For every heart-shaped pizza sold, $1 will be donated to the Boston Pizza Foundation. For almost 25 years Boston Pizza guests have helped raise funds that contribute to the health and well-being of at-risk children. To date, the Boston Pizza Foundation has raised and donated over $18.1 million to charities in communities across Canada and around the world. So, here's your chance to check out Boston Pizza and support this amazing foundation! Contest is open to the residents of Canada only - sorry! Disclaimer: While I was given an additional gift card for my personal visit to Boston Pizza, my views are my own and I still love the food there! The spicy buffalo chicken pizza is what my boyfriend and I always get when we go to Boston Pizza. It's simply delicious! Ohh! I haven't tried that one yet! Loved the BBQ chicken though. I LOVE mushrooms on my pizza! Pizza Burger! It's enough for 2 people. Chris and Graham and I had it awhile back. Yeah, I have heard great things about the #PizzaBurger! Looks like a massive meal! Def shareable! They have amazing drinks as well! She doesn't like sushi, but I'm sure she'll love Fishbowl Fridays!! Right, AwesomeJennJenn? Did someone say Fishbowl Fridays?! I'M IN!! 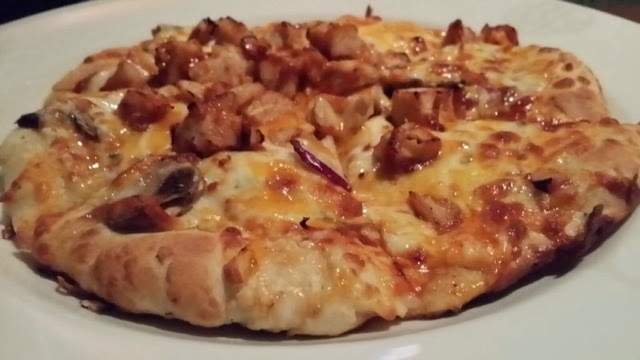 The BBQ chicken pizza is delicious! Good luck! Oh, nachos! Someone at another table ordered those last time I was there - they smelled fantastic! The #heartshapedpizza is so cute, right? And as if we needed more if an incentive to buy pizza, they donate a portion of the proceeds to the BP Foundation! Good luck with the gift card giveaway! Thanks for entering. That Pizza Burger has EAT ME all over it for me!! It looks SO good! I seriously have only heard good things about it. Good luck, thanks for entering! Any type of pizza, of course! You know, I've never had Hawaiian pizza...never been a fan of pineapples! The #heartshapedpizza is so great because it benefits the BP Foundation - love it! Good luck! I've had the chicken parm - it's delicious. True story! The Spicy Perogy is my favourite pizza. love it. Spicy Perogy is my favourite! I really need to try a Hawaiian pizza now! Everyone keeps talking about them! Good luck, thanks for entering. That pizza burger sounds interesting! Pizza with lots of pineapple,and nachos,,yummm! I love the perogy pizza!